This is crazy simple to do. I feel like a fraud for posting this but whatever, it’s DELICIOUS and tasted like a million bucks. I wish I had made more! Also, instead of bacon bits, I used fried dried shrimps, which gave the fluffy baked potatoes the saltiness and crispiness it needed. They went surprisingly AWESOME together! 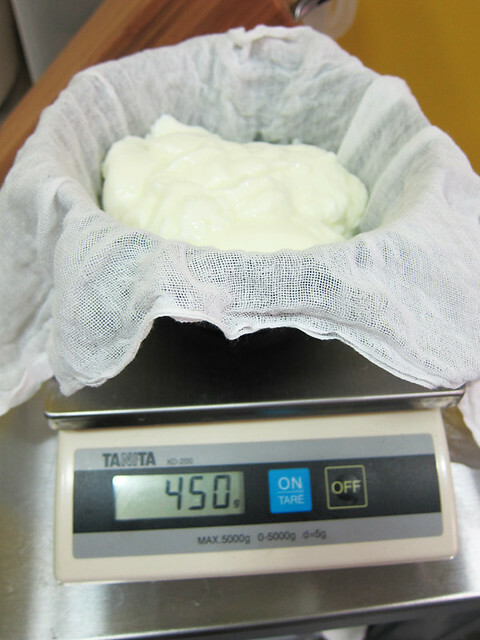 # – Firstly, measure 450 grams of yogurt and put them on a teatowel or muslin cloth to drain. 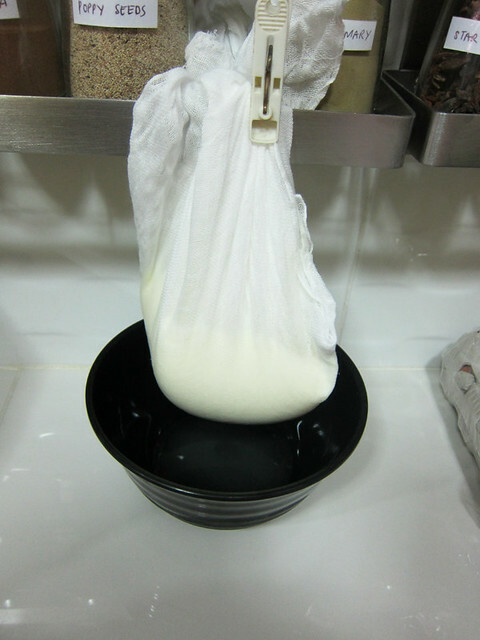 # – Check out my makeshift yogurt draining system :D This process makes the yogurt very creamy….almost like sour cream! 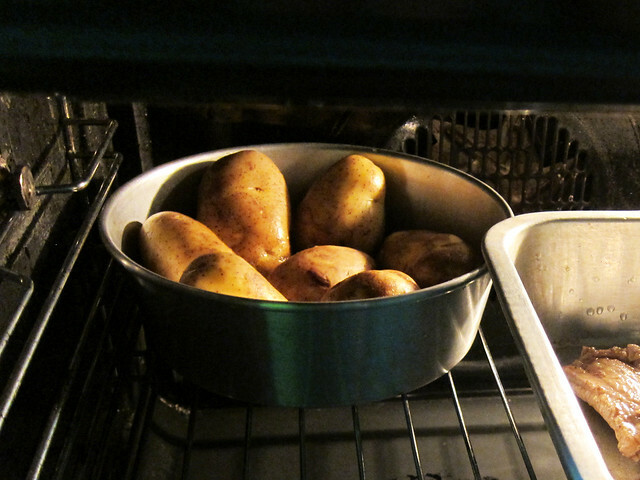 # – Now, clean and dry the potatoes, put them in a baking tray, then stick them in the preheated oven at 230 degrees celcius for 45 minutes. Remember to turn them half way through so they’re all evenly baked. 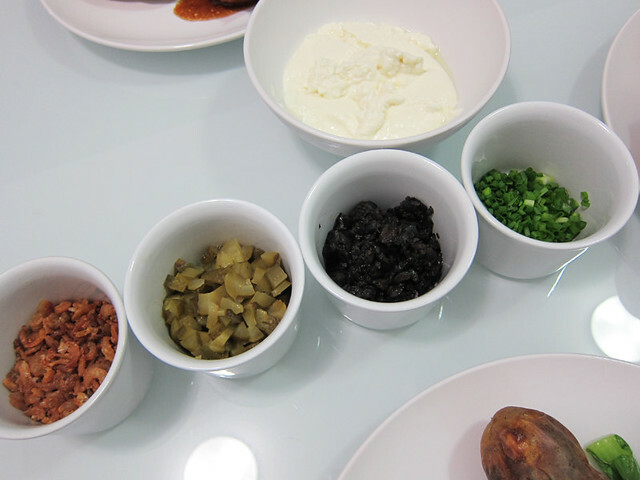 # – Now, to do the toppings…chop up the rest of the ingredients and place them in individual ramekins: [L-R] Crispy dried shrimps, gherkins, olives, spring onion and a bowl of strained yogurt. 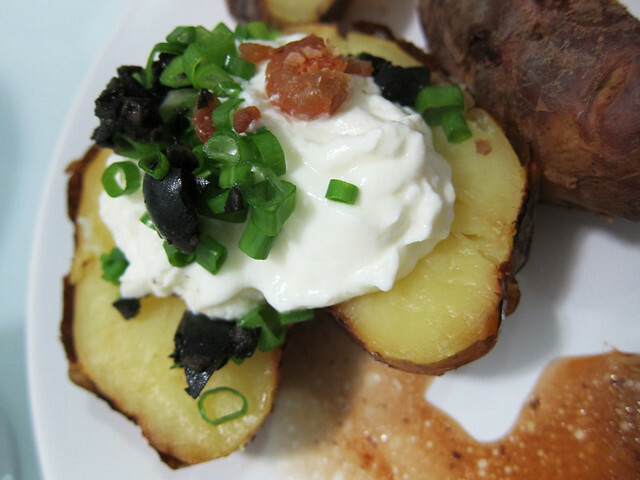 # – To serve, split each potato in half and whack on the toppings :) Yummy baked potatoes, DONE! The best thing about baked potatoes is that there are no set toppings. You can even use ingredients like baked beans, grated cheeses….even deep fried Spam cubes, teeheeheee. All you need to do is exercise some brain cells, take some time to browse through your pantry and lastly, use your creativity! Just roll it your way. 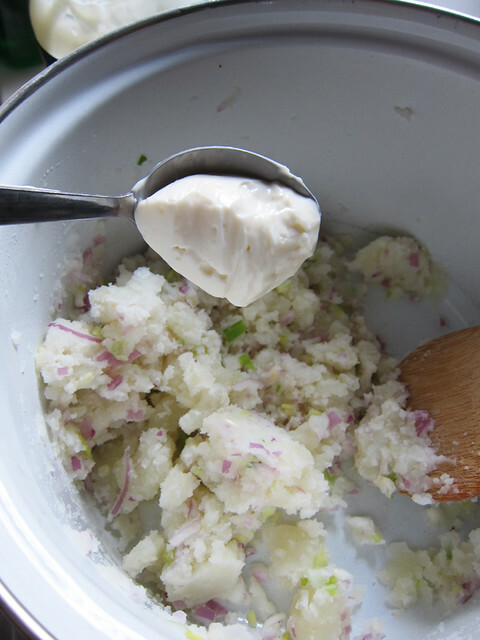 Lastly, I implore you to try the drained yogurt as a sour cream replacement…it is absolutely wonderful. Creamy, tart, decadent and believe it or not, healthy!!!! This dish is another one that I grew up eating. In fact, it was a childhood favourite! 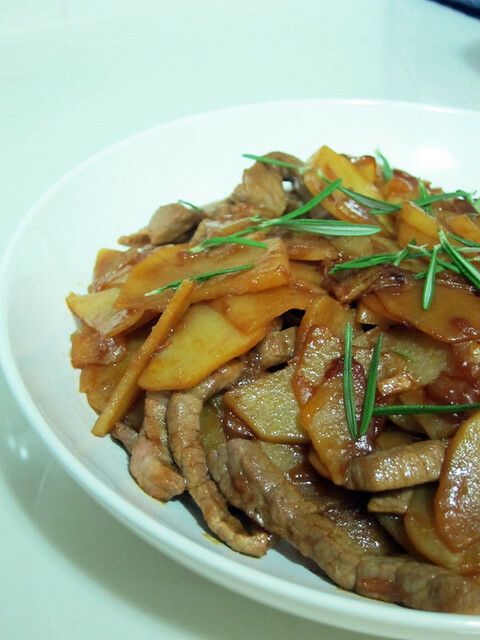 My mom used to cook it with either minced pork or pork fillets but this version that I’m blogging about uses beef steak cut into strips. You can even use chicken, or whatever meat you fancy, except perhaps seafood. 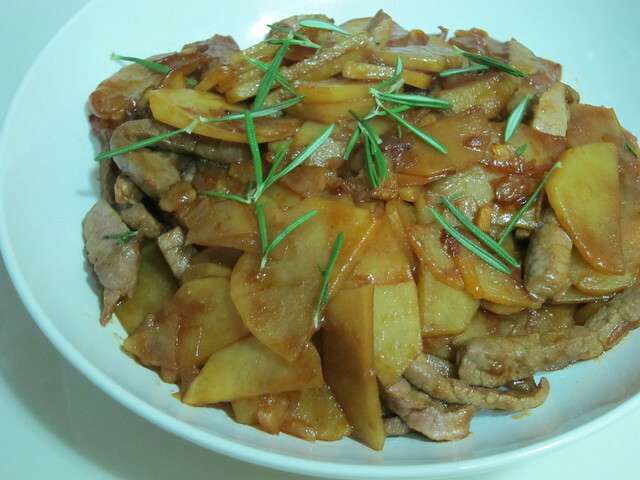 The main star of the dish however, is not the meat. It’s the potatoes. They’re soft in the middle and slightly crispy on the outside. And they’ve got a very appetising sort of smokiness to them, derived from the chinese dark caramel sauce. 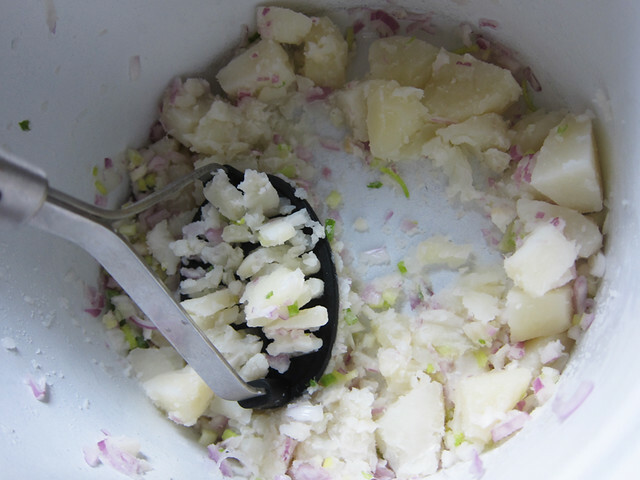 # – When the onions have turned a bit translucent, throw in the potatoes. Stir around for a bit till they’re a bit browned. # – A few dashes of Worcestershire sauce. # – Drizzle over the dark caramel sauce. # – A good tablespoon of salt. # – Followed by a tablespoon of chinese rice wine. 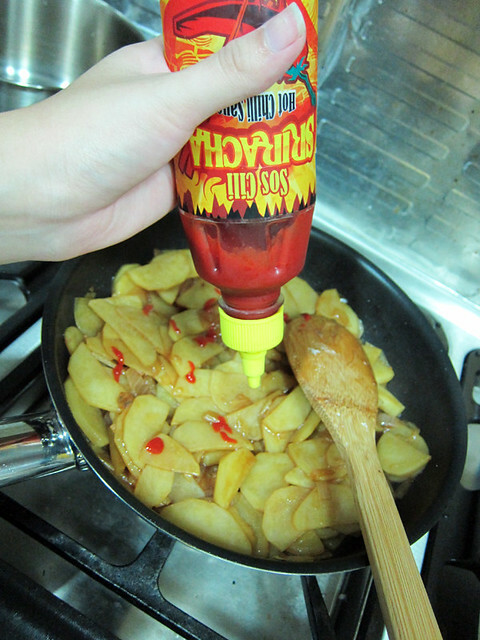 # – And lastly, a tablespoon of chilli sauce. Mix till all are combined. 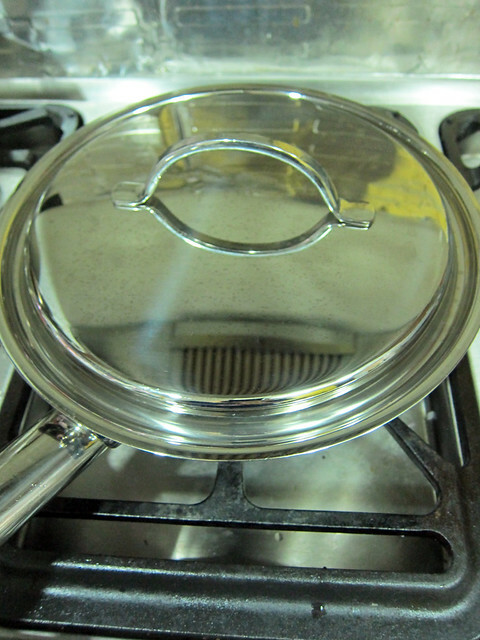 # – Then cover the pan with a lid, turn the heat down to medium and let the spuds cook for about 15 minutes. Stir occasionally to prevent sticking. 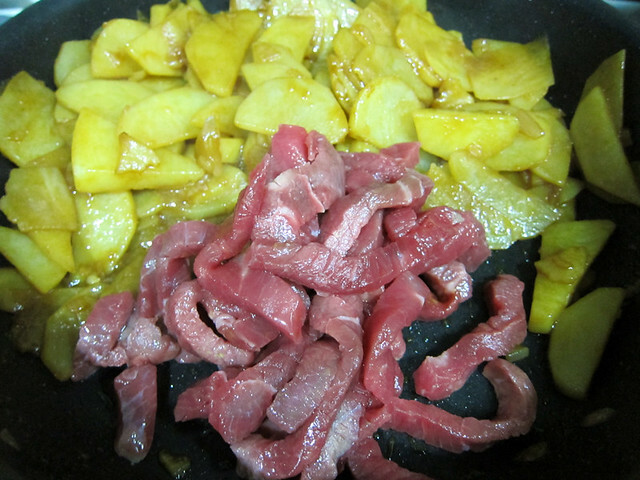 # – After that, push the potatoes to one side in the pan, and throw in the beef. # – Drizzle a wee bit of dark caramel sauce over the beef. Stir to combine. 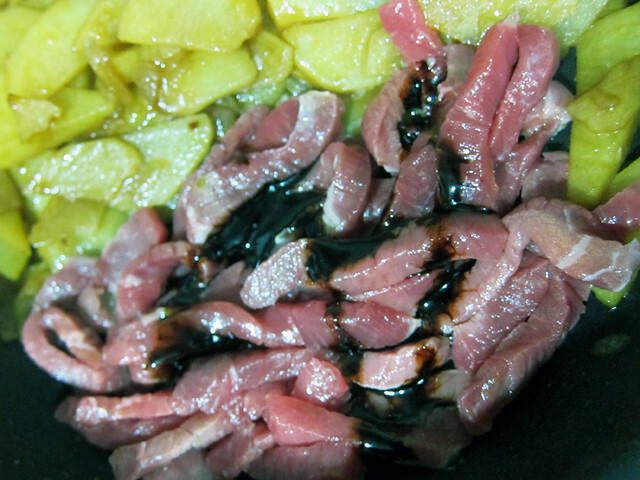 You don’t have to cook beef too long but if you’re using chicken or pork please make sure you cook them through. 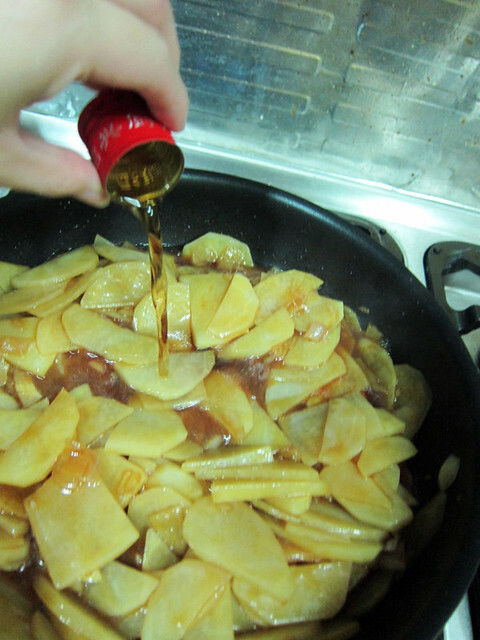 You can add chopped chillies for some kicks or more caramel sauce if you like the dish darker. 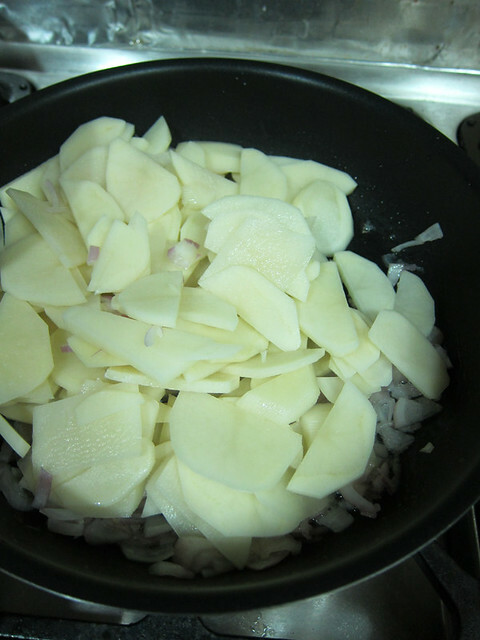 You can also slice the potatoes thinner or thicker, depending on your preference. 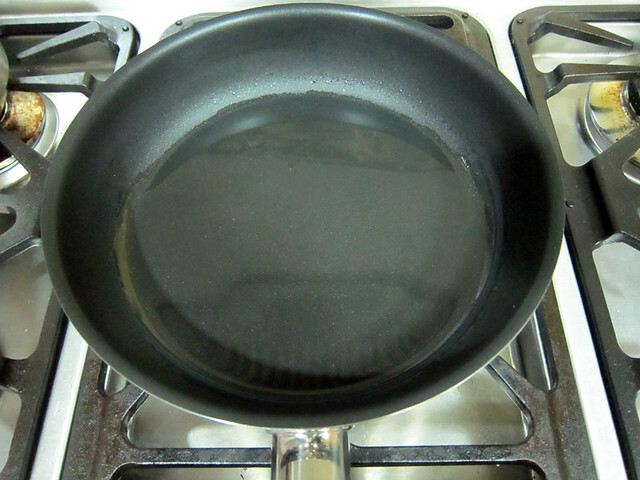 Sometimes I pan fry the potatoes first without adding any water for a much more crispier taste. 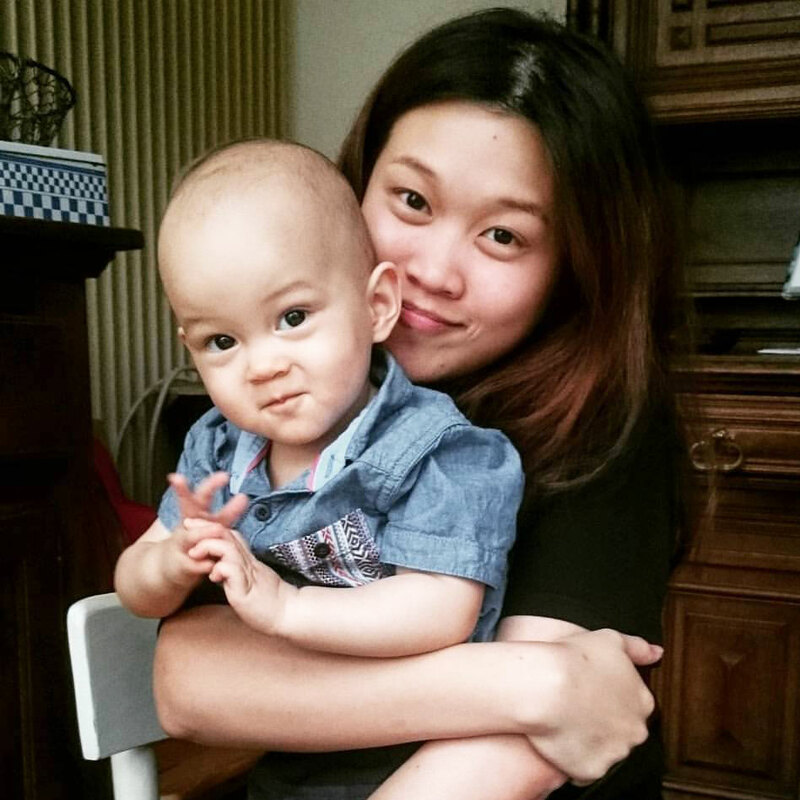 Eat together with rice or do I what I used to do when I was little….eat everything and save the potatoes for last. 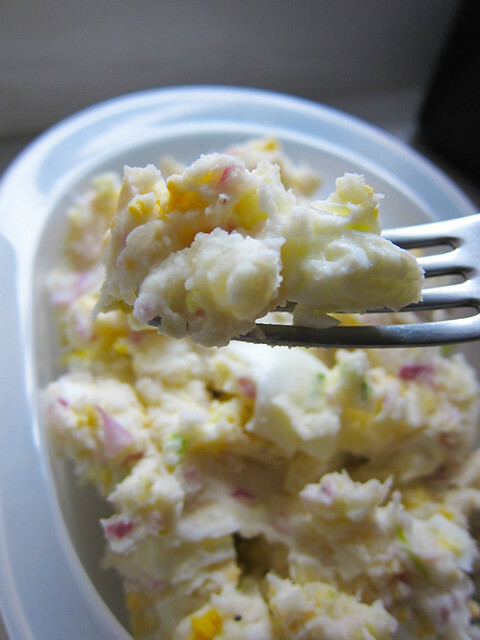 Chilled potato salad, just the way I like it. We love potatoes in our household. Unless we’re having rice, we’re surely having potatoes. Sometimes, I even serve potatoes with rice, hehe. There’s just something really satisfying about eating potatoes. It makes me happy. It makes my toes curl. It makes me sing happy songs. And potatoes are so versatile, you can turn them into so many different types of dishes, it’s quite mind boggling really. 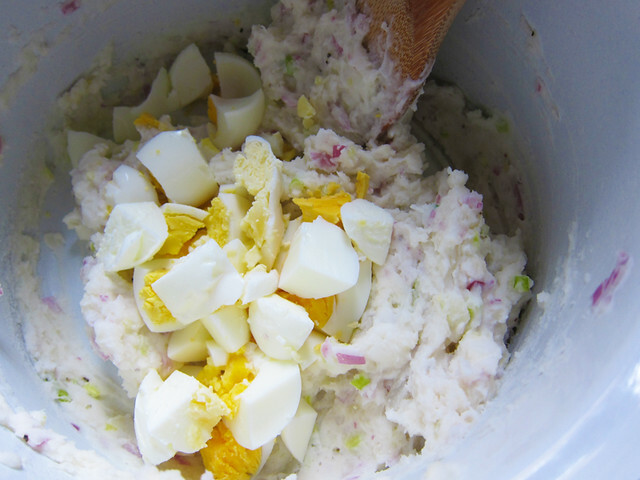 My most favourite potato dish is layered potatoes, but the truth is, I’m also a not-so-secret potato salad fiend. 1. 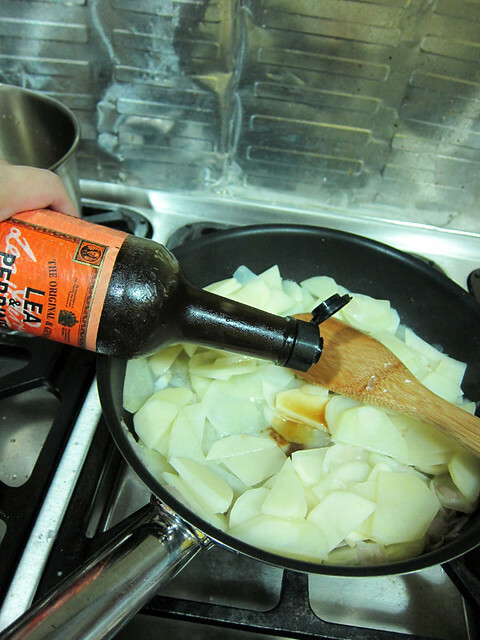 The potatoes should be cooked through but not overcooked. 2. The salad should be well-seasoned. 3. The salad should have onions. 4. 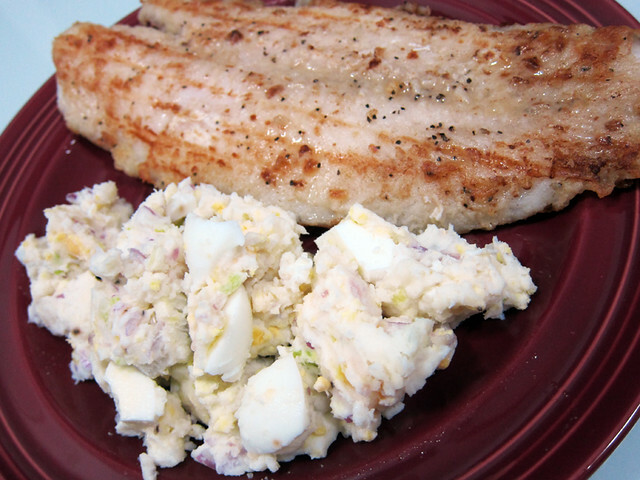 The salad must have a mixture of mashed and chunky potatoes. 5. The salad MUST be chilled. 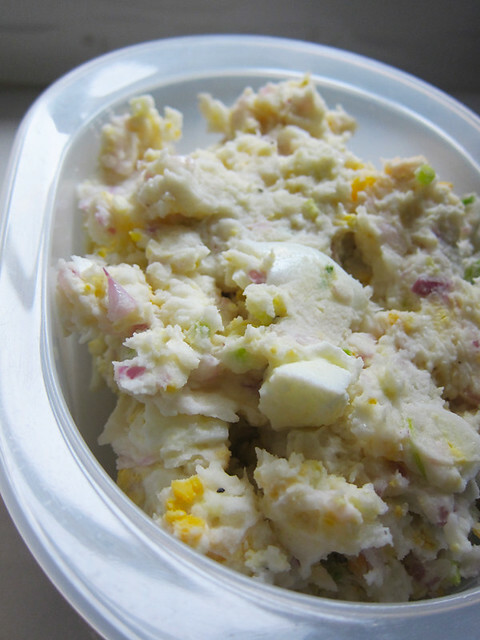 There are few dishes that should strictly be eaten chilled and potato salad is one of these dishes. 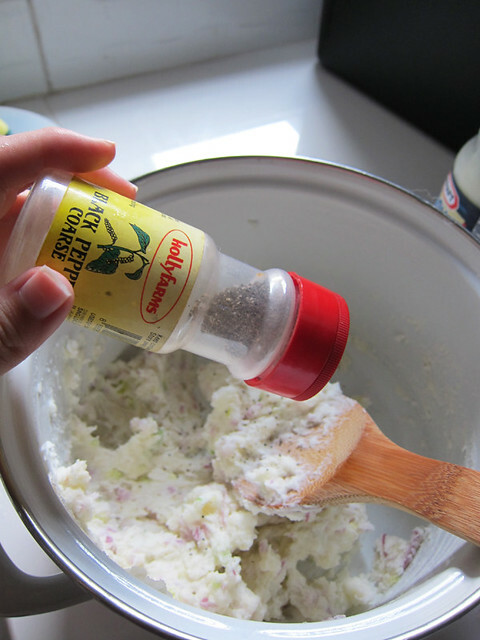 Sorry, I am autocratic when it comes to the temperature of my potato salad…. 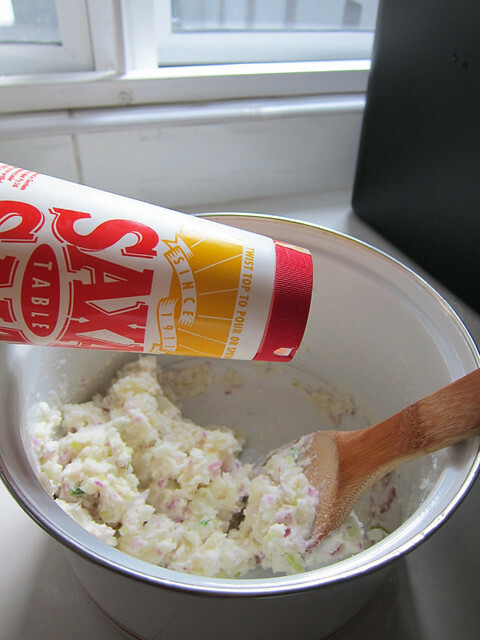 So now lets make some potato salad, just the way I like it! 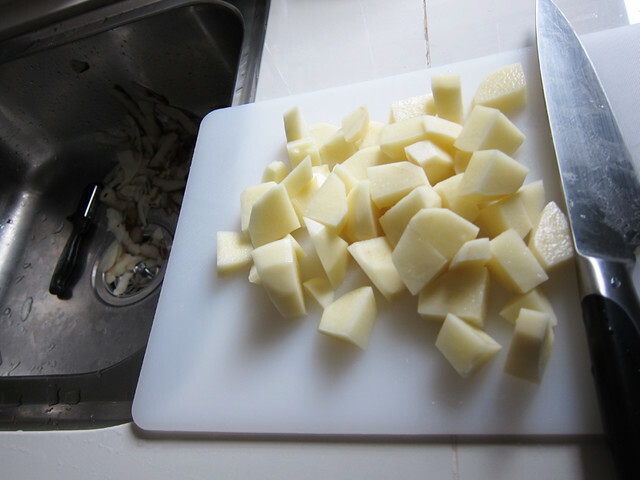 # – First, peel and chop up the potatoes. 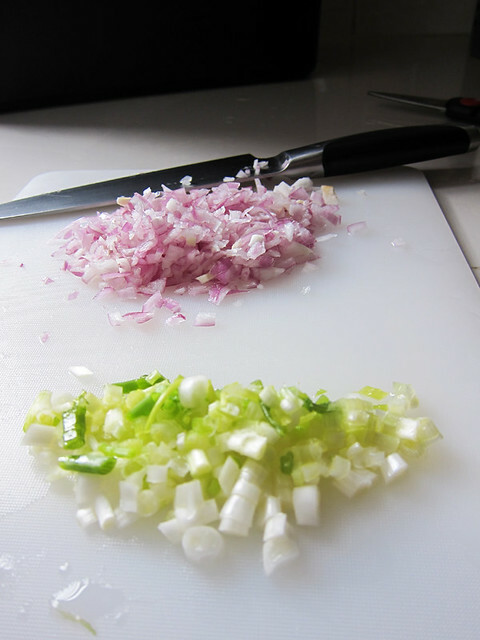 # – Then finely chop up both spring onion and red onion. 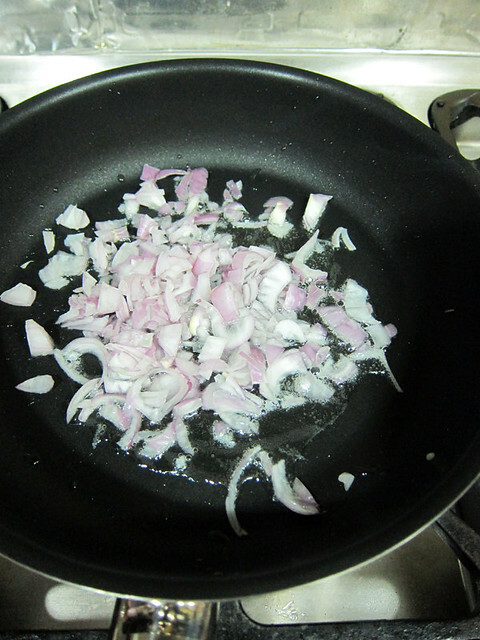 Yeah, baby I love my onions! 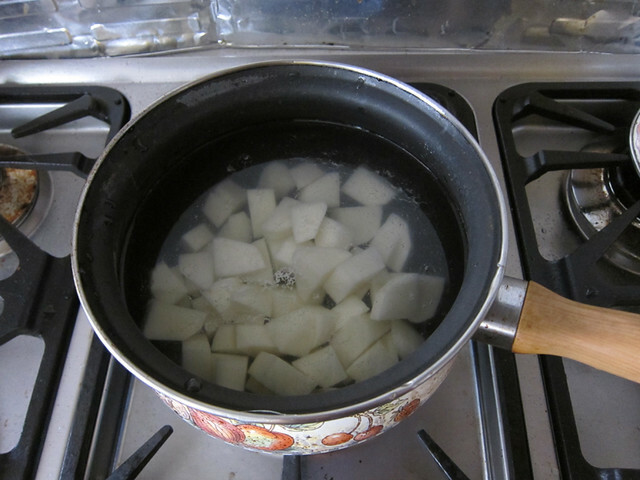 # – Put the chopped potatoes to boil in slightly salted water. I’d say about 15-20 minutes, but do check with a fork…when you can poke it all the way through, it’s done! 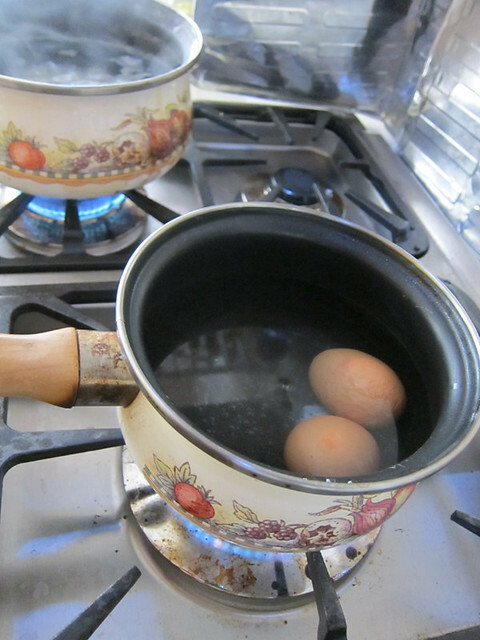 # – In the meantime, put the 2 eggs into a pot of water. Turn on the flame and let the eggs cook for 10 minutes. Turn off the flame and let it sit for 5 minutes. Then remove eggs from water and let them cool down. 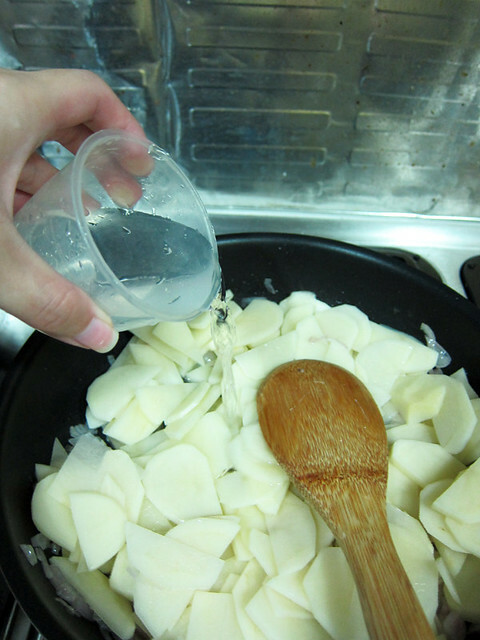 # – After the potatoes are done, drain them. 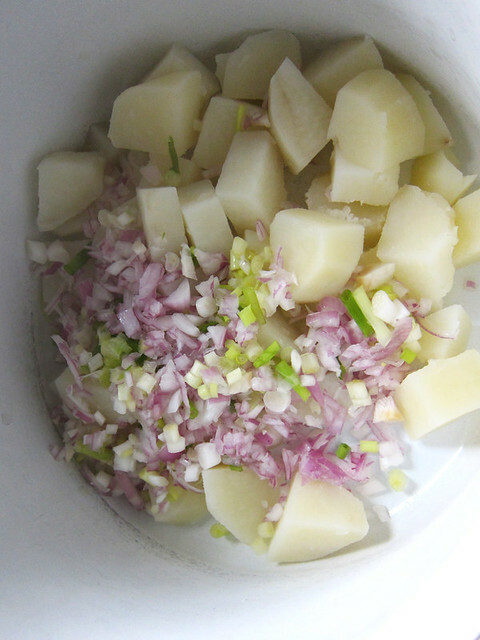 # – Throw the drained potatoes into a mixing bowl together with the finely chopped red onion and spring onion. Ideally this should be done while the potatoes are still quite hot because the heat will cook the onions a little bit, making them taste less harsh. 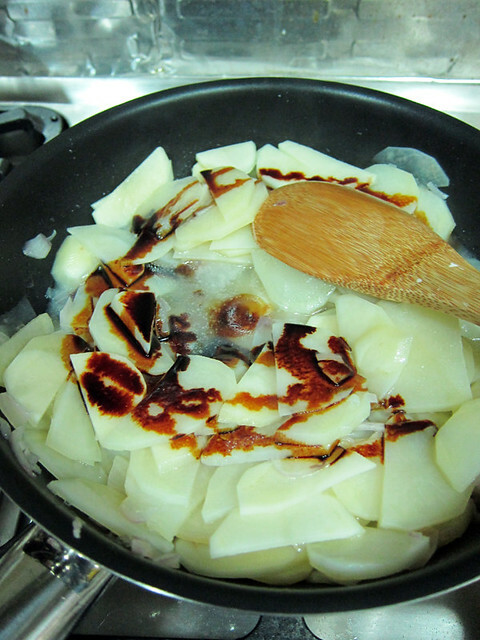 # – Next, stir them around till it looks like the potatoes are coated with the onions. 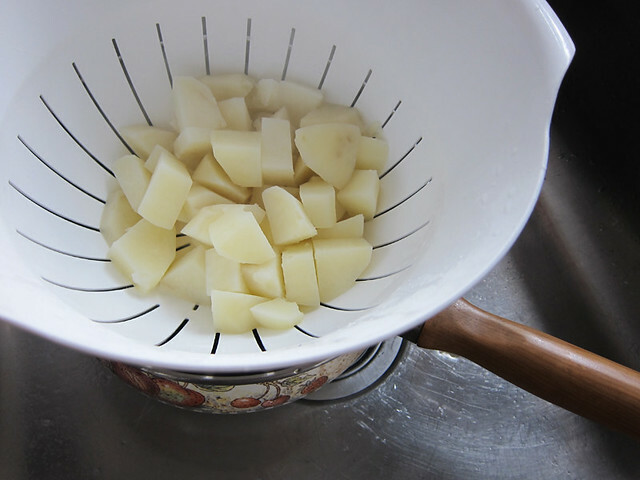 # – Then with a potato masher, mash lightly till you get some mash with chunky bits. # – Now throw in 3 big dollops of mayonnaise. Stir to mix. # – Some salt to taste. 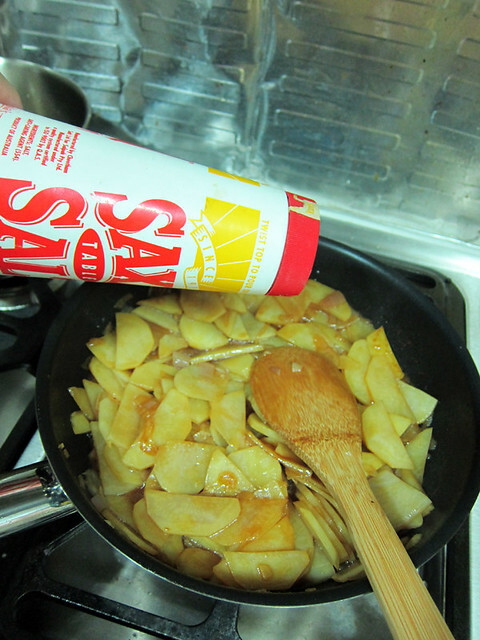 Don’t be too heavy handed with salt….taste as you go! # – And some black pepper. # – You eggs should have cooled down by now. Peel the eggs and cut into bite-size. # – Transfer them into a container that can fit into your fridge. 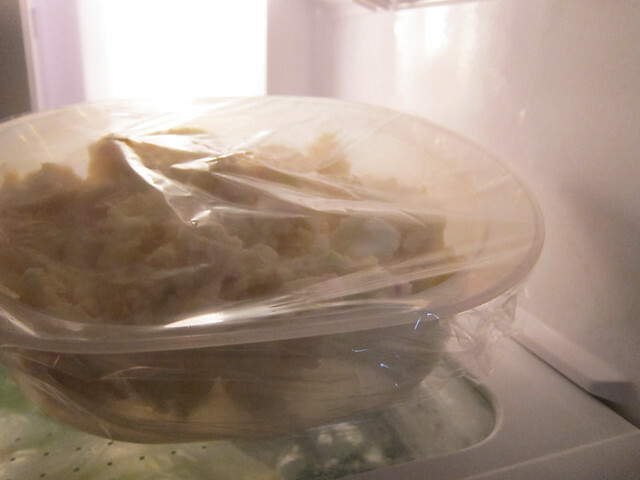 # – Wrap the container with clingwrap and stick it into the fridge for at least 2 hours. # – Serve with your favourite main dish. I made the salad for our dinner of pan fried dory with lemon oil sauce. 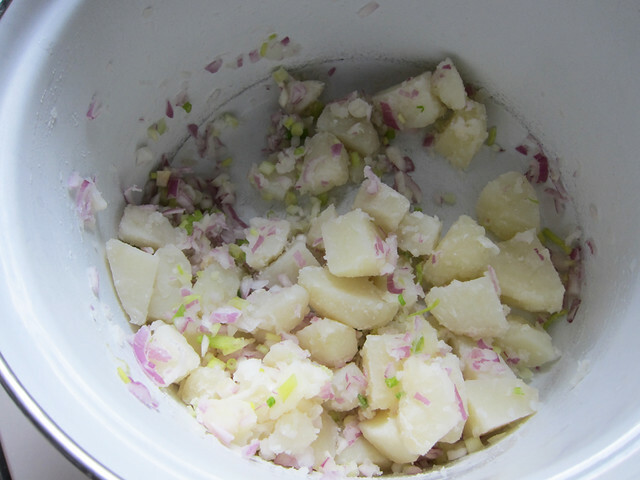 And there….chilled potato salad, just the way I like it. 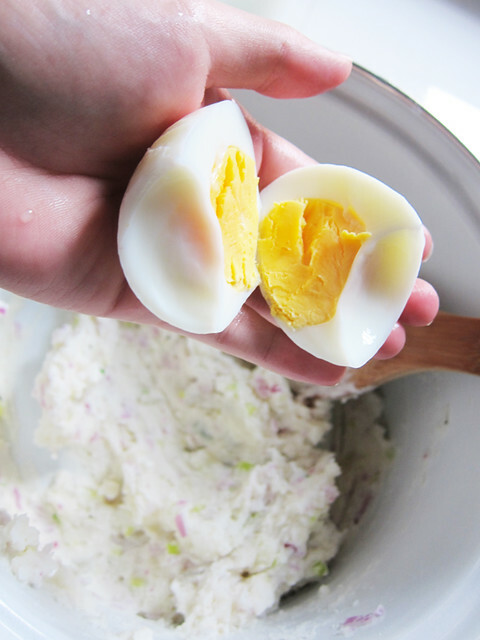 The cold, creamy potatoes with perfectly boiled eggs, punctuated by crunchy onions….my kind of comfort food. Get some potatoes in the system, now!